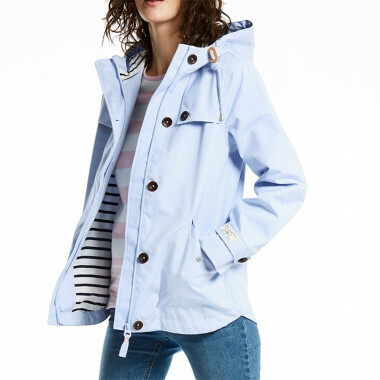 This sky blue waterproof jacket brings to your outfit a marine style with pretty summer colours. This rain resistant jacket is as pretty as breathable. It features a zipper closure and long sleeves with buttoned cuffs. Double closure at the front by a zip and 5 buttons. 2 side pockets with flaps closed by a snap button. Waterproof seams. The integrated hood and lining are with navy and white stripes. 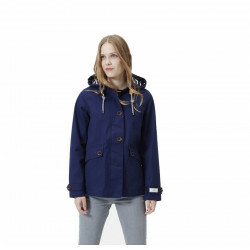 The hood is adjustable with a blue cord gives for a marine style, ideal for walks by the sea! This shorter boxy style jacket is the perfect accompaniment to any British summer wardrobe. Body lining: 65% polyester, 35% cotton.